This is the last of three parts of the sixth volume in a seven-volume collection - published between 1864 and 1890 - comprising Venetian and other northern Italian state papers relating to England. Translator and editor Rawdon Lubbock Brown (1806-83) lived for many years in Venice, had unrivalled access to the Venetian archives and travelled widely to find documents in other Italian libraries and archives. He had previously published Sebastian Giustinian's dispatches to Venice from Henry VIII's court (also reissued in this series). This third part of the sixth volume contains documents from the years 1557-8, the last years of Mary I's reign - when her husband Philip II was absent for much of the time - up to her death and the accession of Elizabeth I. 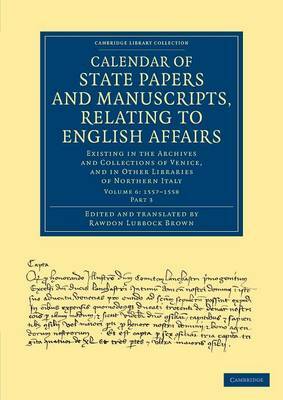 Also included is an appendix of documents concerning the House of Este and its relations with the English dynasties from the Plantagenets to the Tudors.